Most people couldn’t tell you the six different types of portable fire extinguishers, let alone what each is primarily used for. There are real life consequences to not having the right type of fire extinguisher in the area the fire extinguisher is designated for use. It is important to know the type of fire extinguisher you need and the type of fire it will be expected to extinguish. Not too long ago, while at a construction store picking up supplies for a mini cabin I was building at the time, I overheard a young couple talking about which fire extinguisher they should buy. After a short glance at the prices, they opted for the small 2.5oz fire extinguisher and were off to get more supplies. Because I don’t know how or where the fire extinguisher was going to be used I don’t know if this was the best option for them. Price should not be the determining factor in purchasing an extinguisher, as there are several factors to consider, such as fire extinguisher type, its size and intended location of use. Before we dive into the 6 different types of fire extinguishers, we need to understand the Fire Triangle. To start and maintain a fire there are three needed elements. Those elements are heat, fuel and oxygen. If you take one of the three elements away the chemical reaction (Fire) will be extinguished. – Pump Tanks Class A Ordinary combustibles – Wood, Paper, Cloths, Trash, etc. Water extinguishers are used only on Class A fires, where the source of fuel is wood, paper, cloths, trash, or other such items. You should never use a water extinguisher on Class B, C, D or F fires because of its electrical conductivity and inability to mix with and create a barrier between oil or gas. Water fire extinguishers work by removing the heat from the fire. Water Extinguishers have two designs: Stored Pressure and Pump. The stored pressure extinguisher operates by breaking the tamper seal and pulling out the safety pin with a squeezable handle located on the top. With one hand on the hose and the other hand on the fire extinguisher handle you squeeze the lever, point the nozzle and discharge the agent. The pump pressure extinguisher comes in two different styles: the floor standing model and a backpack model. Depending on the size of the fire extinguisher, the volume of the extinguisher is between 7 – 25 liters, a spray duration from 45 seconds to 180 seconds (depending on its tank capacity) and a range of 9 to 12 meters. The Carbon Dioxide fire extinguisher contains compressed carbon dioxide, a gas agent. Carbon Dioxide fire extinguishers are used on Class B and C fires (flammable or combustible liquids and energized electrical fires respectively). If no other option is available, Carbon Dioxide fire extinguishers may be used on Class A fires. When the agent is released from the fire extinguisher, the CO2 replaces oxygen in the vicinity where the fire extinguisher was discharged to the point that the fire is extinguished. Because the carbon dioxide is discharged in a form of a cloud which consists of a mixture of both solid and gaseous CO2, the discharge range is short compared to other fire extinguishers. Any wind or drafts may cause the agent to be disbursed away from the fire. While carbon dioxide in not considered toxic, care should be taken to avoid discharging the extinguisher in a confined space and thereby reducing the O2 availability for breathing. Just like the Dry Chemical fire extinguisher, the CO2 agent is discharged by pulling the safety pin and squeezing the lever while pointing the nozzle or hose at the base of the fire. Avoid touching the end of the hose or “horn” of the fire extinguisher as it will be extremely cold and could cause cold burns. There are two types of Dry Chemical fire extinguishers, Regular and Multi-purpose. Multi-purpose dry chemical are rated for Class A, B, & C fires with use a chemical known as ammonium phosphate as the base agent. The regular or “Purple K” dry chemical fire extinguishers are used for Class B and Class C fires. Stored Pressure: The stored pressure model has a rechargeable or disposable shell. Cartridge: The cartridge model contains either carbon dioxide or nitrogen to discharge/expel the agent to the fire. The Dry Chemical fire extinguisher removes the heat from the fire in extinguishing the fire. Dry Powder fire extinguishers are designed to extinguish Class D fires (combustible metal fires). Unfortunately, due to a variety of different metals, e.g., magnesium, potassium, aluminum among others, there is not one single agent that is designed to extinguish all of the different metal fires. There are two types of Dry Powder fire extinguishers, ABE and BE class fire extinguishers. The most common of the two is the A, B, & E fire extinguisher designed for ABE class fires. The B, E Dry Powder fire extinguisher is used to extinguish Class BE and F fires. (Class F fires is capable of extinguishing cooking oil fires. Interestingly enough, the F is not included in the rating of the fire extinguisher). The Powder used in the ABE Fire extinguisher is monoammonium phosphate and removes the heat from the fire when the powder lands on the fire and melts, thereby smothering the fuel source and removing the heat. There are two types of foam fire extinguishers, wheeled (nitrogen cylinder) and portable foam (stored pressure). Foam fire extinguishers are used on Class A and B Fires, however, they are most commonly used on flammable liquids such as keytone, alcohol, acetone or esters. Foam fire extinguishers work by starving the fire of fuel. The foam seals the surface of the liquid thereby preventing the vapor from making contact with air (Oxygen), extinguishing the fire. Because the fire is extinguished from a seal over the surface of the liquid, foam fire extinguishers are not as effective on free flowing fires with gases that are escaping under pressure. Wet chemical fire extinguishers are most commonly found in industrial kitchens because they are specifically designed to combat cooking oil (Olive oil, sunflower oils, butter, lard) fires, labeled Class K fires. However, Foam fire extinguishers can be used to extinguish Class A and Class B fires if no other option is available. Wet Chemical fire extinguishers form a soapy solution that works to extinguish the fire by creating a type of sealant on the surface of the fuel, creating a cooling effect on the burning oil. Like other fire extinguishers, wet chemical fire extinguishers us the chemical agent potassium to extinguish the fire. 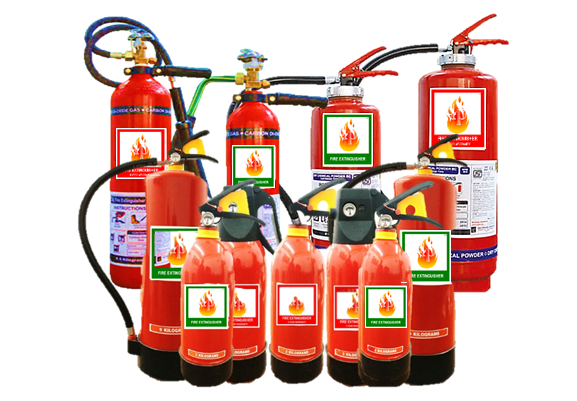 It is extremely important to select the right fire extinguisher for your fire safety needs. Individual fire extinguishers are designed for specific purposes and should be used specific to the suppressant agent they contain. If you’re looking for any of these portable fire extinguishers or other wheeled fire extinguishers, please check out our line fire extinguishers at OnlineSafetyDepot.com.